Hello all! I just wanted to give some personal feedback on my Gelish experience since we picked up this amazing nail line. 1. Apply Base Coat as thin as possible. It should not be "slick or shiny" looking - it should look "orange peel shiny -- with texture". Overuse of base coat is the most common problem with applying Gelish. If you have slick shine BEFORE you cure, you have used too much foundation. 2. CAP THE FREE EDGE WITH EVERY LAYER! Our recommendation is to cap the free edge first, then apply product to the nail bed. If you cap the free edge first, when you pull the color down the nail plate, you remove the bulb at the free edge. If you cap at the end, you risk leaving a bulb at the free edge. Other than some grow-out (hey, I can't control how fast my nails grow, they thrive with Gelish!) my polish still looks great. At 17 DAYS! Under normal circumstances, I can't keep my polish looking this good for 7 days! It is still in tact, with a shine that looks like it was just applied. Definitely A++++, Gelish! Gelish...The Gel Manicure that's getting everyone Jealous! What has been missing from the manicure world?? Gelish…..The product that every nail tech needs to know about! 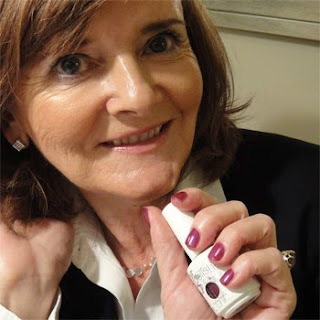 By now, I am sure that every nail technician has heard of the gel manicure and most of you have probably even heard of Nail Harmony’s Gelish, but how much do you really know about the Gelish products? Gelish isn’t like every other gel manicure on the market. 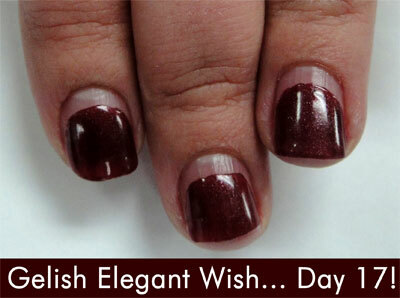 What sets Gelish apart from other gel manicures is how it is formulated. 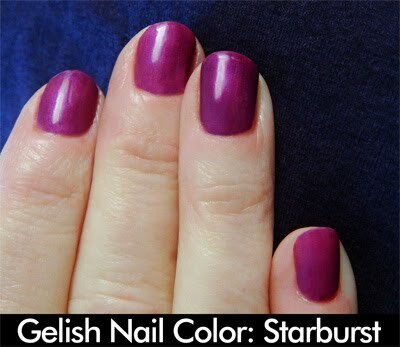 Gelish is a pigmented gel whereas other gel manicures are lacquer/hybrids. 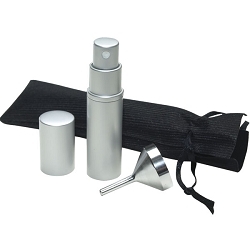 In simpler terms, this means you will never have to shake a nail polish bottle again! Ever have a client complain that there favorite color looks a little different this time then the last time they got it? Gelish will make that question completely disappear! The reason that makes all this possible is because a pigmented gel means the color of the polish is always going to be the same, causing consistency bottle to bottle, application to application. Being that Gelish is a pigmented gel also means that you will be providing your customers with a product that lasts longer, won’t deplete or damage their nails, and will give them the strong nails they always wanted. With Gelish’s proven performance, your business will expand like never before. No girl left behind! With 48 colors and 48 more coming in soon there is a color for everyone, every age. Gelish will attract a whole new clientele that you haven’t been able to reach with other products, including girls that have never gotten manicures before. With 20-30 seconds cure time, you can do more manicures a day then you ever thought possible which will increase your profits. No more smudged nails which means no more wasting time fixing a smudged nail. From French manicures to multi-colored glittered manicures, Gelish will allow you to provide clients with a variety of options. When placing a Gelish order with Pure Spa Direct we will help do the advertising for you! Each order will contain a Shelf Talker at no additional charge. Clients will finally be able to have a long lasting manicure, up to 21 days of perfectly polished nails! Clients will have piece of mind before vacationing, finally their manicure will make it past the plane ride. Clients will be given the opportunity to have fun with the variety and options Gelish will offer them. Something for every occasion – all year long! Clients will feel confident in knowing that they can have a long lasting manicure that protects the nails instead of depleting or damaging the nails. Your clients will appreciate not having to get a manicure every week, and a happy client makes a happy business & referrals! Article Written By Gelish client Cecilia from Arlington, TX. Hands can tell you so much about a person. As a professional business woman, keeping my hands and nails presentable with regular manicures is essential. But for years, I, like so many other women, found myself with polish chipping in just a matter of days, or sometimes hours post-manicure. The only alternative I was offered to avoid this was acrylic nails, but after years of wearing them I ruined my natural nails and vowed never to go back. So then I heard about a product called Gelish, which offers long wear gel polishes in a generous array of colors that can endure up to 21 days of wear. A polish that can last more than a few days without compromising the "well being" of my natural nail sounded amazing! Price doesn't matter at this point, I just HAD TO HAVE IT! Not only is this ideal for my everyday life, while sorting through 48 gorgeous colors, I was thinking about how great a Gelish manicure would be before a beach vacation (my mani / pedis don't hold up well at the beach), or how perfect this would be for my next trip overseas (I hate traveling with polish). My mind was racing with excitement about how a polish with this kind of longevity will make my nail issues a thing of the past. The Gelish process was seamless and quick! Basically, the process is painting and sealing, leaving me with high gloss, smooth, and completely dry nails. The tech used an LED curing light that took only seconds to "cure" the Gelish and my nails looked perfect! Despite my busy lifestyle of gardening, working out, lots of housework and lots of typing - there are NO signs of chipping, peeling or lifting. I love the peace of mind Gelish gives me: I can relax and live my life, without worrying about my nails looking ugly or unpresentable for the next few weeks! Gelish addresses my 2 major concerns, polish longevity and beauty while keeping my natural nail protected and healthy. Gelish is an excellent quality product, and I highly recommend to my friends all over the country to find a salon that offers Gelish manicures. Finally, a way to conveniently have healthy, beautiful nails!